Con Martens, a writer in desperate need of divine inspiration and both literary and moral guidance four years after the runaway success of his debut novel, “Sirens in the Streets,” has escaped to Key West to ease his suffering from writer’s block and dwindling money. To complicate matters, he gets tangled up with two passionate women—one, Cat, a fierce lawyer who, to his terror, professes to love him; the other, Eva, a Czech refugee who proposes to marry and take care of him, financially and sexually, in exchange for her green card. One night, after a wild Cat fight, Con ends up in a bar. Over rum, he meets an intriguing stranger named Nick, who happens to be a dead ringer for the young Ernest Hemingway. Before long, Con is hooked on drinking, fishing, and soaking up advice from a man who could be crazy…or just might be “Papa” reincarnated. 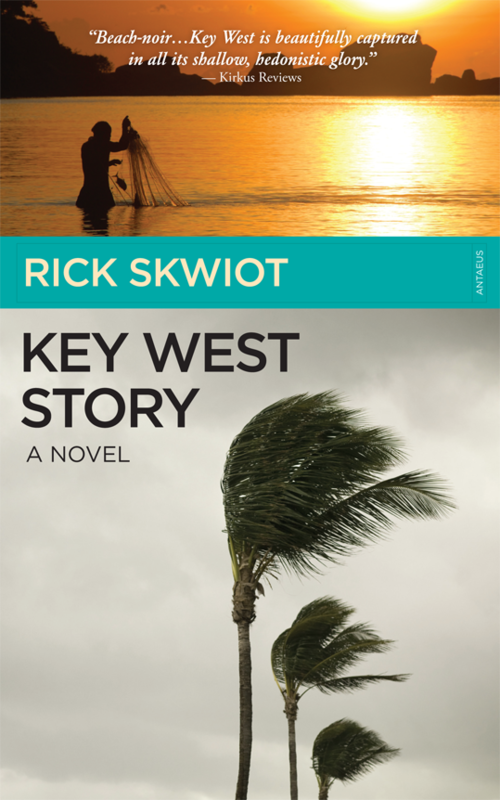 Against the backdrop of mangroves and mansions, Key West Story moves from Key West to Cuba, flirts with dream lovers, braves one formidable hurricane and several tempestuous personalities, and offers a bounty of wisdom about writing, living, and loving. Recommended for anyone interested in the REAL Key West, Ernest Hemingway, Cuba, tropical settings, romantic adventures, or humankind’s search for meaning. Award-winning Key West-based novelist and memoirist Rick Skwiot is the author of the Hemingway First Novel Award winner Death in Mexico (previously published as Flesh), the Willa Cather Fiction Prize finalist Sleeping With Pancho Villa, the critically acclaimed childhood memoir Christmas at Long Lake, and, most recently, San Miguel de Allende, Mexico: Memoir of a Sensual Quest for Spiritual Healing. He has taught creative writing at Washington University in St. Louis and served as the 2004 Distinguished Visiting Writer at the University of Missouri-St. Louis. Co-founder and director of the nonprofit Key West Writers Lab, he lives in Key West, Florida. “Having a protagonist who is a writer is not easy to pull off–writers are not known to be action figures after all–but Rick Skwiot does it beautifully in Key West Story…In the end, the appreciative reader will have gotten to know several unique Key West characters, many of whom have lost some rudder power in their own lives, and all of whom find their core, their heart and their destiny, some in unexpected ways, with a salty Atlantic breeze at their backs.–Susan McKinney de Ortega, author of Flirting in Spanish.